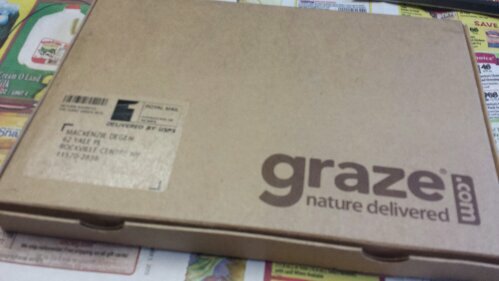 Hey guys… I’m so excited because: MY GRAZE BOX HAS ARRIVED! Seriously, it’s in the top 3 things I look forward to in the mail each month. Not only is it affordable and delicious, but it’s also mailed out in limited qualities so it makes me feel like a VIP. I really should have one sent each week seeing as I consume it in about 10 minutes or less. As usual, they have a cute customized card on top with stickers such as “Mackenzie’s Box” and various others. And then on the back of it is the nutritional information section so you can see all the ingredients, carbs, sugars, calories, etc. 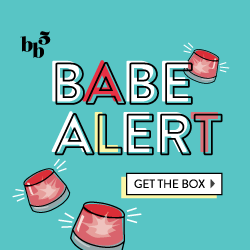 Here’s a look at my box this month! I love how they change up the picture on the top of the box each month- it looks so fresh and elegant. 1. Pear Tatin- a delicious blend of yogurt chips, dried fruits and nuts! I was really hoping to get this one soon so my wish was fulfilled. 2. Lightly Toasted Pistachios (which were in K’s box last month so I’ve already tried them) which are simple and tasty, but I would have preferred something more adventurous. 3. Boston Baguettes- Flavored mini baguette dippers with a BBQ tomato dipping sauce. I was a little skeptical at first, but they’re pretty good! 4. Pina Colada- a blend of dried coconut, mango and pineapple! Tastes like the one that comes in my Peckish Co. Box. I have my fingers crossed for some salty/spicy trail mixes and some dried fruit blends next month! 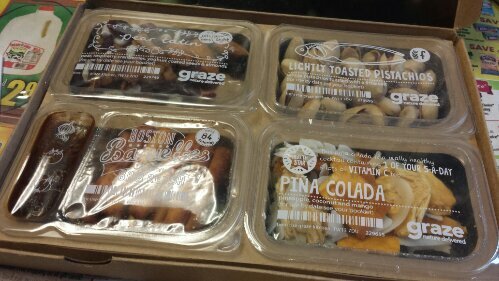 What’s your favorite Graze Box snack?? ?